Last week we wrote about Elks and postcards, and this week we've got more on the topic. The women shown in this postcard - currently on display in our reading room exhibition on postcards - were probably helping out with an Elks lodge 'Mawsim', or Moorish-style event and bazaar. The postcard dates from 1907-1912 (FR 005). "Memories of a vanishing race will be awakened by the rich Oriental decorations that will be a feature of the Moorish "Mawsim" and Bazaar to be conducted by the Scranton Lodge of Elks...Who that has read the delightful yarns of Washington Irving in his "Tales of Alhambra," has not yearned for a glimpse of the land that gave birth to the Moors? ...This opportunity will be afforded the thousands of pleasure seekers who attend the "Mawsim" of the Scranton Elks." 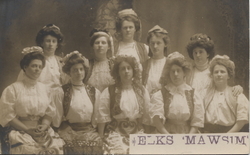 There is little information on the women who supported the Elks during this time period, and who formed an organization known as the Benevolent and Protective Order of the Does. This is partly because the Elks (formally known as the Benevolent and Protective Order of Elks, or B.P.O.E.) didn't officially recognize this group. The Elks only accepted men as members during the early twentieth century, and the B.P.O.E. passed a resolution in 1907 that said that there would be no adjuncts or auxiliaries. The Benevolent and Protective order of the Does (B.P.O.D.) operated only at the local level, with no centralized state or national authority. According to some sources, they did not have a fixed ritual. Other sources say their there were several versions of ritual practised. One version bases the initiation rite on the Biblical story of Mary. Another version makes reference the the thirteenth chapter of Saint Paul's first letter to the Corinthians which emphasizes love and charity. In 1995, the Elks opened membership to women, by changing their constitution and removing the word “male” from the list of membership qualifications; members from the fraternal group’s 2,230 lodges across the entire United States voted on the change. In 2009, women are not only members of the Elks, but they also serve as leaders.